What is a ringer tee? First of all, a “tee” is the same thing as “t-shirt”. 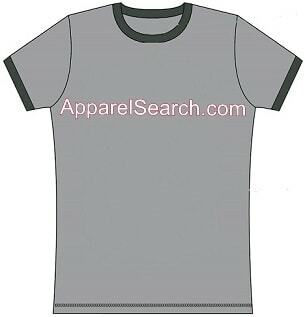 A ringer T-shirt is a T-shirt in which the primary jersey shirt fabric is one color, but the ribbing used for the collar and the sleeve bands are of a contrasting color. Originally the most common ringer colors were white with black ribbing. However, over the years the options have increased dramatically. Ringer style t-shirts come in tons of various color combinations. Ringers were first introduced in the United States in the early 1950s. The contrasting trim color style became popular among youth and the rock-and-roll subculture. The shirt was often worn by athletes and school age children. Ringers grew in popularity as the 1970s began and remained popular throughout that decade. But in the 1980s, other fashions eclipsed the ringer T-shirt. In the early 2000s, ringer T-shirts experienced a resurgence, mostly among teens. Although they had a bit of a surge, they did not appear to reach the level of importance experienced during the 1970s. Ringer tees will most likely come in and out of style as the decades continue to tick past.